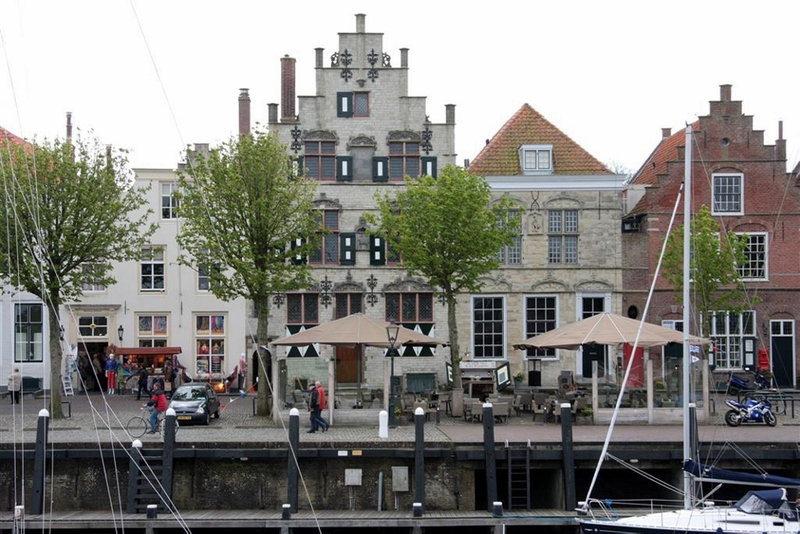 Quite by chance, I came across the news that the ‘Scottish Houses’ museum in Veere, the Netherlands, is on a hit-list of thirty-four properties that the Dutch state intends to sell off as part of its own austerity programme. The museum has launched a fundraising campaign in the hope that it can purchase the historic buildings and give them an independent future, but with so many rival demands on charitable donations, they will clearly face an uphill battle. There seems to have been remarkably little publicity given to this in the UK, even in Scotland, so this blog is my attempt to give it some! The Scottish Houses date from the sixteenth century, and bear witness to the remarkable maritime and economic connections between Scotland and Europe. 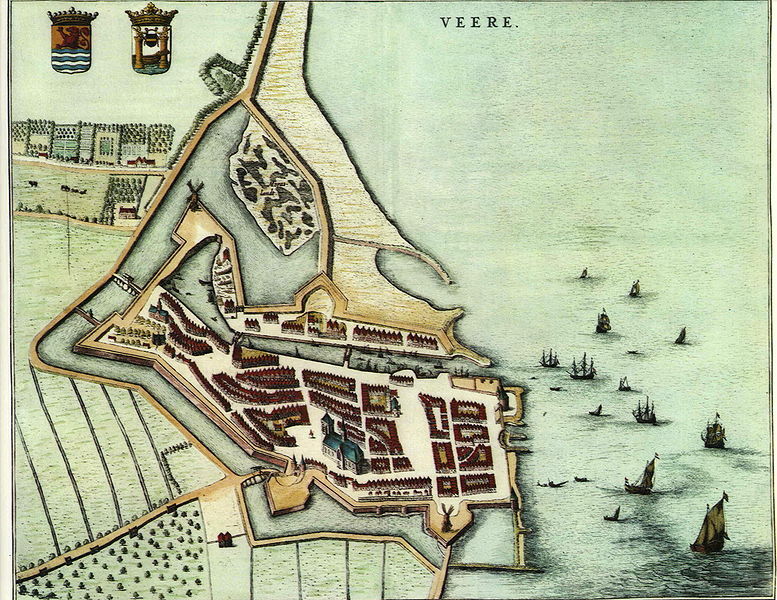 In 1541 Veere, a port in the province of Zeeland, became the staple for the Scottish wool trade with the Netherlands, and a substantial Scottish community was established there. The Lord Conservator, who oversaw the trade, was based in the houses that now form the museum. The staple survived until 1799, so remarkably, it endured through no fewer than five Anglo-Dutch wars, especially the three great ones in the seventeenth century! I came across Veere’s remarkable history when I was researching those wars in the 1990s, and visited the town on a couple of occasions. I thoroughly enjoyed the museum, but perhaps I enjoyed a meal and beer in the cellar restaurant, once one of the storehouses for the Scottish wool merchants, even more! The unique history of Veere also fitted with the growing interest in Scottish history that I was developing at the time, and which ultimately led to my book on the so-called ‘Gowrie conspiracy’ of 1600, Blood of Kings. My liking for the town eventually found expression in the ‘Quinton journals’, too: it’s the home town of Matthew’s wife Cornelia and her sea-captain twin, and it’s where, in Gentleman Captain, Matthew hears the news of the restoration of the monarchy in England. When so many heritage sites in Britain are under threat of closure and running fund-raising campaigns of their own, it’s difficult to make a case for contributing money to a foreign institution. But I’ll certainly be making my own contribution to the campaign to save the Scottish Houses, and if the passing philanthropic billionaires to whom I referred in last week’s post feel so inclined, I’m sure their generosity would be highly appreciated in Veere! I’m delighted to announce that next week, ‘Gentlemen and Tarpaulins’ will be playing host to a guest blogger – bestselling author Louise Berridge, who’ll be talking about the campaign that she’s leading to erect new memorials to those who fell in the Crimean War. It should be a fascinating post, and a truly worthy cause with which to end this mini-series!